Old doctor hold the medicine strip. 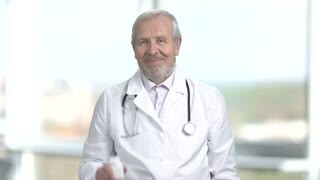 Male senior doctor holding in his hand a package of pills and show thumb up, blurred background. Happy mature doctor, blurred background. Male doctor in white coat holding container with pills at hospital. 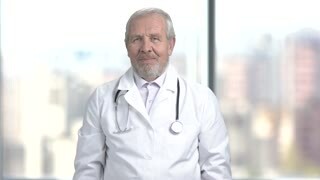 Middle aged doctor showing thumb up gesture. 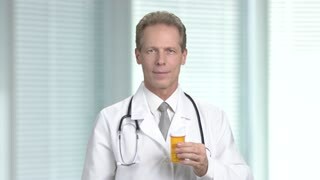 Cheerful male doctor with pills, blurred background. Happy mature medical doctr showing thumb up. Medicine and healthcare concept. 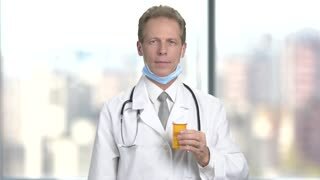 Cheerful doctor with pills, blurred background. Caucasian male doctor holding medication and showing thumb up gesture. New ways of therapy. 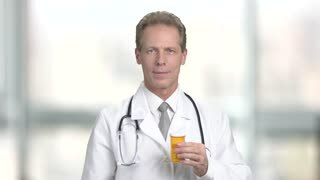 Mature male doctor holding medicine. Smiling male doctor showing container with pills and showing thumb up gesture. Symbol of success. Cheerful senior doctor with thumb up. 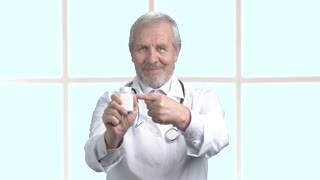 Elderly doctor holding a pills and giving a thumb up gesture. People, medicine, pharmacy and healthcare. Aged doctor holding bottle with pills. Senior male doctor with pills showing thumb up. New effective medical product.